So, I may not have mentioned this before, but my life has been pretty crazy this year. Both my mom and big sis got the flu and both were hospitalized, my mom first, then my sis went in the night before my mom was discharged. Anyway, my mom has needed constant care for pretty much since, although is getting stronger and doing much better. She's pretty old, and I don't know that she's going to recover fully, and will always need someone here for if not all the time, most of the time. Due to my mom's condition, my big sis and I (I moved in with them after my move from AZ), alternate sleeping on the main floor where my mom sleeps, in the case she needs anything. Needless to say, doing this doesn't allow for much sleep, but it is getting slightly better as she is getting more well and regaining strength. 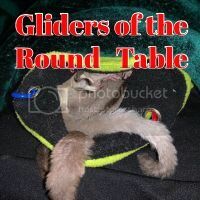 So, this pasts Wednesday night was my turn downstairs and I really didn't see my gliders much (I haven't had so much extra time other than main care since my mom's been sick). However, last week there were two nights when Skadoosh wanted to come out and play. And play she did, it was so fun! She was exploring all over the play, checking things and toys out, climbing in the bins and even glided to me a couple of times each time. The first play session it was just her, the second time, Ollie graced us with his presence and we all had a blast. or I shall say evening when I came home from work. My son has to use my PC to get some stuff done, so he stopped by Wednesday & Thursday after work. He gets here before I even get out of work, so was up in my room Wednesday on my computer. When I got home I came up to check on everyone and say hi. I noticed Skadoosh wasn't out, it bothered me a little, but it actually wasn't that strange as she's not always out of pouch around that time, and with my son in the room, she'd be less inclined due to being unfamiliar with him. So I really don't know why it bothered me any at all, it just did. I was in and out of my room as usual, doing typical morning activities, prepping for work. I always peek in the cage, whether I hear sounds or not, and when I did I saw that Skadoosh was up. Now this isn't that unusual in itself, either Ollie or Skadoosh will be up a little later than usual some mornings scavenging around for nummies or any desired leftover food (usually kibble). But, again that strange sense came over me, which I kept brushing off as being paranoid (been since Lulu's passing, RIP Lulu). Anyway, I could hear movement in the cage periodically and checked in frequently anyway (couldn't shake that feeling). Skadoosh had been perfectly normal in everyway when I saw her Wednesday morning and prior (remember I didn't really have an opportunity to see her much that evening or night), but that feeling??? Every time I checked in on her, she was in a different area of the cage, even in the wheel at some point, so I figured all was okay. Off to work I went, but that nagging feeling something was amiss was still with me. I hope I don't sound like I'm stupid, but I could honestly sense something was wrong, yet still justify that all was okay and not out of the norm, if you know what I mean, I really thought I kept worrying over nothing. Even so, when I returned home from work Thursday evening, I immediately rushed to check on her to be sure. I was hoping that all would be as normal, normal enough that I wouldn't fret over nothing. And even though my son was over, working on my computer, I just really thought I'd run up and be like, everything is fine, Skadoosh is alright, I'm just being paranoid. Only she wasn't, and it was very, very apparent abnormality. I watched her for what seemed like five minutes, but am sure it was only a couple before I scooped her up and held her in my hand. I was checking her out, trying to see if I could tell why she was moving so funny. She was moving funny, not good, not good at all and I was horrified. It was going 7pm by this time and I tried calling the closest exotic vet, hoping and praying they were still open. They were, but turns out their exotic vet left there last October. They gave me some numbers of some others, and we ended up going to the 24hr Falls Road Animal Hospital. We arrived there probably somewhere between 730-740pm (my son came with me, God bless him). I had called ahead to be sure they had an exotic vet on duty prior. I took Skadoosh up to the counter to "check her in", they took her right away and got my information, initial payment and told me that she would be checked out and then they'd come get me. It took a while, but I won't drag this out any longer. Eventually the Dr. said that she examined her and she looked fine and everything checked out okay in initial exam. She said to do any diagnostics (bloodwork), they'd need to sedate her and she felt that it wasn't worth the stress on her when she wasn't feeling so well. She said she felt like the best action was to treat her with antibiotic and pain meds. She said that they could keep her overnight for monitoring or I could take her home (bringing her back if need to). After carefully considering the circumstances and benefits for leaving her or bringing her home, I decided to bring her home. If they had stated that they felt she needed to be kept, I would have left her, but they were just offering as an option, so I brought her home. I felt that she would be scared and lonely left there, this would stress her out more, and Ollie would also be stressed, not knowing what happened to Skadoosh. Today was a long day at work, all I could think of was coming home to take care of my baby Skadoosh. I'm really glad that it's Friday though, 'cause I got two days to monitor her more closely and even take her back if I feel she's not getting better. I know the time inevitably comes when we have to say goodbye, but I don't want that to be the case now. I'm paranoid I'm not getting the meds into her right, I have a hard time telling what she's getting. I worry, I have a chance to save her that I didn't have with Lulu. And what about Ollie boy? What happens then if we loose Skadoosh too? I'm not in an arrangement where I can set up a second dwelling for a new cage mate, there is simply no space available here for that (I barely have space for me and my gliders, hence living out of a storage unit pretty much). What will my options be? I don't want to give him up, could I keep him alone? So many questions, so many worries. Oh, Terry, I'm really sorry you're being hit like this... much less back-to-back with Lulu. I'll keep you & your Skadoosh in my thoughts so hopefully the good vibes go y'alls way. Make sure she knows that any glider with an awesome name like that MUST stick around! I am so sorry to hear that you are going through all that you are. As far as Skadoosh, err on the side of giving her a bit more antibiotics for the dribble and spit factor. Give her the pain meds first then follow up with the antibiotics. 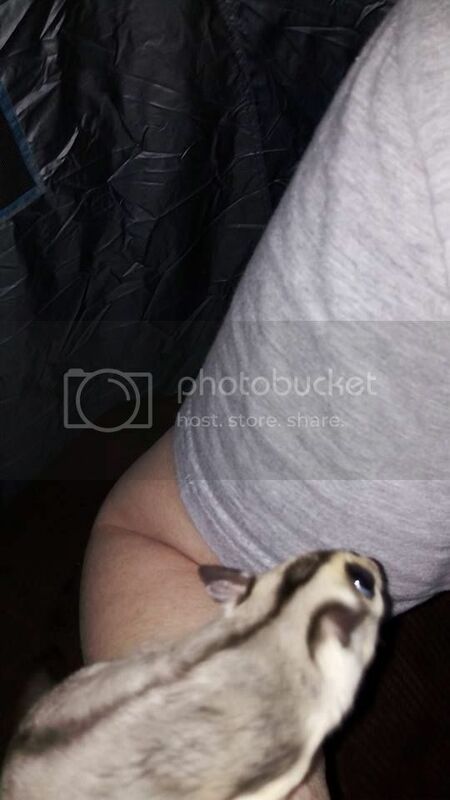 I have one of my friends gliders here taking care of him because he was on two different antibiotics. He is also trussed up in an e-jacket. I will keep Skadoosh in my prayers. Thank you Hutch, will do, I've been telling her to stick around, now I have another reason to tell her to do so for. Kimberly, I did that Friday morning, then was afraid I over dosed her, so was more precise for evening dose. I will do as you say from here forth. They gave her pain med first at the vets, so I did the same. She gets that one more night (3 days). I'm so scared when she's sleeping, I want to curl up in the pouch with her., I can't sleep. I hope your getting your rest. I'm sorry to hear about Skadoosh. Hopefully she is feeling better. It may be a good idea if by Monday or so, she's feeling well enough, to get the blood work done. It might be a good idea to have Ollie checked too. Prayers for you and your little furbabies! I did get a couple to few hours sleep. Skadoosh is still with us this morning, more med to be given around 8am. I'm not really seeing her eat, but I did see her drinking from water silo yesterday morning. I've seen her twice since on top shelf near the silo, though I lowered the sleeping pouch closer to the floor level. There is also another water source available, closer to the pouch, but I guess she prefers the silo. I didn't see her actually drinking anything those last couple of times, but hoping that's why she was up there. Last edited by Terry; 03/10/18 08:29 AM. Terry, it breaks my heart to read your post and all you are going through. I am glad to hear your mom and sister are getting better, but know your mom does face a hard road ahead. This flu is so devastating on our senior systems. Keeping her in my thoughts and you as well along with your family. Thank you Karen. My mom is 89 years old, but she's being a real trooper. It sure has been a tough road thus far, but she's gaining strength. I've seen Skadoosh drink some water, but little of anything else. A few licks of melon, possibly eating a little. I saw that she actually peed a little before going to bed after mess this morning. I know it was her because she was the only one up and I had already cleaned the drop tray. A small puddle was in the tray, just under where she had been sitting for a minute, I think that's a good sign, right? It is, and you know to keep checking her for dehydration It sneaks up on them very quick. Thanks again Karen, will do. I'm going to get her up in a few and try to get her to drink a little more water now. Being the weekend, I want to take advantage of being home during the day to try to get her going on fluid intake. So, as mentioned in above posts, I've actually seen Skadoosh taking a drink from the silo, and have spotted her around it a couple of other times, hoping she's been drinking. I also have seen that she's peed twice now, so that's what I've seen so far. She will not take solid foods, not even treats. However I did make up a batch of CLC and she did lap some of that. I've been using a silo cup for her feeding, I set up a bin with some fleece and paper towels for med administration and wanting to offer her some food where I can actually monitor that she's taking anything. So I put some f/v in the larger part of the cup and then pour some nectar over it, so it flows into the trough. This works great because the round cup part that fits the silo holds a few pieces of f/v and then the nectar is available in the narrow part. This evening, this was some CLC I just made up mixed with a little water from where the f/v thaw (I pour that over top their f/v in their bowls, for added moisture). She's had her last dose of pain med, and is on day 2.5 of her 10 days of antibiotics. I learned I have to burrito her in a little fleece blanket and squirt directly into her mouth. She was more active today in the bin, and I think moving a little better. However in the cage she tends to just go sit somewhere and stay kind of slumped. Ollie misses her when I have her out for meds and feed monitoring I believe. He appears to look well and all his body functions appear normal as well. So I'm really kind of feeling like she had some type of infection, at least I hope so. If it's a urinary infection, I'm kind of surprised I hadn't seen signs. But then, due to current circumstances, I'm not spending as much time around them as I would normally, so I guess I could have missed it. Anyway, seeing her drink in something nourishing and seeing her move around a little gives me a little confidence that she will be okay, but I'm still a little scared. She did actually nip at me both am and pm med times today, so getting a little feisty with "I don't like that momzy" attitude. Does she like Avocado? If so I would off her that. Yogurt also. Right now anything she will eat, even if it isn't the healthiest. Just so she is getting calories. Glad to hear she is feeling a little better! I agree with Feather on calorie intake. Antibiotics may make her a little constipated. Thank you. She doesn't seem to care too much for yogurt, unless I offer vanilla mixed with honey. I'll make a little dish for her tomorrow morning, so I'll know if she's eating it and not Ollie. I offered scrambled egg earlier today, around 3 and only Ollie would eat it. I've never offered avacado, we don't really eat it, so it's never around to offer. I don't know if she'll eat it. I will try the vanilla yogurt and honey first, if she doesn't eat that, I'll pick up an avacado later and try offering it. Last edited by Terry; 03/11/18 02:29 AM. You can chunk it up and freeze it. I would say that 99.9 % of gliders will inhale avocado. When I feed it, the avocado is the first thing they grab. I think the best you have offered her so far that she has taken is the CLC because it has so much that she needs even if she doesn't take any f/v. Like any mom though you want her to take more. She may just need more time for the antibiotics to do their work. Thank you Karen, I do feel good about her taking the CLC, she lapped up pretty good this morning. Didn't touch the yogurt with honey, I let Ollie have it. Tonight will make her treatment 3.5 days, but I'm getting better at giving it to her, so a little more confident in her receiving the dosage. Kimberly I still am considering picking up an avacado though, curious if they'll like it. How do you serve it, does it get peeled? Does it have seeds that needs to be out? Last edited by Terry; 03/11/18 01:10 PM. Terry, avocado has one large seed in the middle. See here which needs to be removed. After peeling, it can be smashed, diced or sliced. For Skadoosh, smashed would probably be best at this point. Thank you Karen for all that info on avocados, lol. Skadoosh showed absolutely no interest in the avocado, however Ollie enjoyed the snack very much. I'm not giving up on offering it, I will try again to add some to their meals throughout the week or for a snack, especially when I separate her from him at med time, I like to offer her some food to observe if she eats anything. I'm on hold with the FRAH currently. Asking about her appetite and what I should expect to be normal and not normal. She does seem to move a bit better, a bit more active when up, but she still looks ragged. Okay, so just made a follow up appointment for next Saturday. If she does not improve further by Tuesday, or takes a turn for the worse anytime prior or after I'll take her in as an emergency. If she is well by Saturday, they told me to cancel the appointment. Terry, is she still taking the CLC? Yes Karen, she drinks that pretty well. Actually just going to share some news. I removed the nighttime meal from cage just as Ollie decided to come out to grab a bedtime snack. I let him drink a bit of CLC, as he kept going for it every time I touched the silo, lol, it was so cute. He got a yogi. Anyway, I fixed a fresh dish of watered-down and got Skadoosh out of pouch in hopes she'd drink some. She went immediately to where the silo of CLC was, but then did end up drinking the mixture. She kept going back to look for CLC and I considered bringing her some, then decided on bringing up some pumpkin. Ollie ate some, Skadoosh was drinking some of the Gatorade/water. Then I remembered the grapes. So I went down and cut one in half. She's eating it!!!! I mean she is going to town on this thing! She's still eating it as I type, and believe me it's been a quite a few minutes since I got on here to share this update. I'm leaving what's left of grape, pumpkin (Ollie ate some), and the Gatorade/water in the cage for the day, just in case. She gets her meds at 8, go to go, lots to do before work today. And yes, I got a bit of sleep last night, even though I was up a couple of times checking in, no one was up at those times, so went back to bed (got to sleep in my bed last night, tonight is mom-duty). I may sleep for a week after all this is over, lol. Last edited by Terry; 03/13/18 07:18 AM. Will think happy thoughts and prayers for all of you! Your update is very encouraging, Terry. I would let her have all the CLC she wants and not worry about anything else unless she seems to want other food items. CLC will give her the nutrients she needs right now. Anything beyond that is a bonus. She will also get her liquid from the CLC. Thanks everyone! Right! It is good progress. Thanks Karen, I was glad to see her drinking CLC, I figured it was nourishment along with fluids. However, I had a concern about her urine being so dark yellow. It's getting lighter again with her drinking more plain water, and maybe perhaps the Gatorade mixture. I got in and pulled Skadoosh out of the pouch, offering her a half of orange slice (like a clementine sized). After she took it and began to eat it, I got Ollie out and gave him the other half. They both ate some, not all, but that's okay. I took a little CLC that was left in a bottle and added some pumpkin, quite a bit of it actually, then added a tad of vanilla yogurt. I'm a bit worried she's constipated, I saw her tail going up like she was trying to poo, but none came out. I figured she'd get some nutrients if she drinks it, but so far hasn't touched it. It is served on the side in a small dish (same as Gatorade/water). I will serve their f/v bowls at usual time, then bring their regular CLC up a little later, I just want to see if she'll drink it, I want her to be able to poo. I am feeling rather encouraged, I guess it was just taking a while for the meds to get her to feel well enough to start trying to eat. She is still washing her face as usual, so I feel good about that too. Ollie and her have been so sweet to each other. My main concern is that she poops I think at this point. She could be a bit constipated because she is dehydrated. When you or an animal gets dehydrated they leach water out of their digestive tract to use elsewhere. Keep pushing clear fluids when you can. Thank you Kim, so should I worry about adding Gatorade to water or just offer plain water? Oh also will grapes help with that? Skadoosh won't touch pumpkin,in any form, but will eat some grape and orange apparently. Offered half a grape to each, both accepted and ate some, can't leave Ollie boy out, lol. Looks like I should pick up some grapes. Last edited by Terry; 03/14/18 01:33 PM. Skip the gatoraide, keep giving grapes. Pick up a water melon. Right now juicy fruit and water are her friends. They will hopefully get her poops going. I have been following this Terry! Glad to read the appetite is heading the right direction! Good news! Thank you Kim, I will pick up grapes and watermelon. Thank you claralice, she seems to accept grape and orange, but so far I haven't seen her to touch any of the salad. She does drink CLC.